A collaborative mixtape from the rap duo. 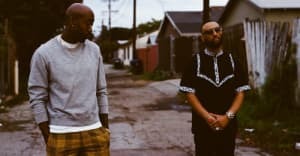 Freddie Gibbs and Curren$y's joint mixtape is here. Fetti was given a Halloween release by the duo and can be streamed below. The 9-track mixtape features production from The Alchemist and is the first time Gibbs and Curren$y have worked together on a full-length project. The pair first announced plans for Fetti back in 2017. Since then Gibbs dropped his Freddie mixtape while the prolific Curren$y shared solo EP, The Marina.